Apply for tutoring under the direction of Maestro Aldo Vidali and in 10 weeks you’ll be given the opportunity to become a co-producer and be part of the 2006 Uneco Cinema Production Unit during the shooting of the movie. Fellini-Antonioni Studio & Uneco Films will take professionally trained students and Fellini lovers on the movie making adventure of a lifetime in Rome for the entire month of October to explore and create a motion picture about the greatest film author of all time: Federico Fellini and what he would say today. The film will be directed by a good friend and collaborator of the late great maestro: Aldo Vidali. The movie you will participate in will bring to the world Fellini’s vision, his comments on the human condition, and glimpses of his profound reflections that will expand our understanding of life and love. Those who have learned from and loved the great magician of cinema will flock to see this great historical work that will make Fellini live again as a voice for our troubled times. 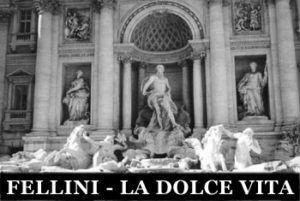 In Rome you will meet a number of Italian movie people and some of Fellini’s old friends. You will enjoy a unique life experience, dine in the restaurants Fellini frequented, and visit the places where he made his films. When viewed through Fellini’s tolerant, compassionate, and penetrating wisdom, Rome itself becomes a great 2000 year old teacher that gives us back a sense of proportions and lifts us above the aimless agitation of the modern world to return our spirit to our true and noblest human dimension. Humor will be an important part of this unforgettable mission. If you are among those who desire the exhilarating experience of the magic of human love and seek to discover the joy of creating in the incomparable style of Maestro Federico Fellini, then this will be the most unforgettable chapter of your life.The total tuition for 10 weeks of tutoring is $5000. To participate as CO-producer of this not-for-profit cultural and educational work, you will need $50,000 including your travel expenses and share of equipment rental and post production costs.